History: The exact origins of the Church of the Dark Father are unknown. It is a Satanic Cult, though many of the members joined it on a lark, actually seeking a different source of peace and love and rebelling against modern society. A number of these members believed that Satan was not the enemy of mankind, but rather its redeemer: that Satan was good and kind, and that he wanted wanted them to love him and love each other. (Vampira Tales#3 (fb)) - "Satan" appeared to Ruth Cummins in a dream, touching her shoulder and telling her, "One day you will serve me. Your life will leave you--and be yours forever." Upon her shoulder was permanently left the mark of Satan. (Vampire Tales#3) - On the streets of Los Angeles, Ruth Cummins and a small group of the Church preached the benefits of Satanism. Politician Harry Gotham confronted and spoke out against them, whipping the crowd into a frenzy against them. 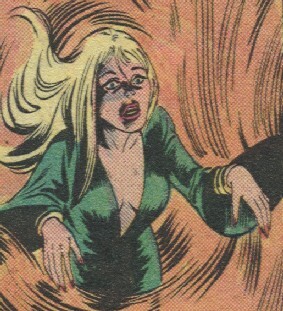 Satana appeared between the groups and dispersed the crowd, despite the harangue of Gotham. Ruth invited Satana back to her apartment, and the two revealed they each possessed the mark of Satan. That night, Darkos Edge and his agent, assassins sent by Gotham, broke into Ruth's apartment to kill Satana. Unaware that Satana would be able to handle their assault, Ruth leapt to her defense and took a blow to the head that killed her. Satana slew Edge's agent and then drank the soul of both Edge and Gotham. (Marvel Spotlight I#24 (fb) - BTS) - Gloria Hefford's mother died at some point in her youth. A girl bored with college and the straight-and-narrow life, she wanted something more, something...better. Her quest led her to Los Angeles, to Satan. (Haunt of Horror#2/6) - As part of the Church, Gloria became roommates with Gloria, whom she believed to be just another Satanist. (Marvel Spotlight I#24) - Gloria, thought to prove herself a witch, a demon sorceress, by conjuring a demon from Hell. Ignoring the advice of the elders of the Church and unaware of the consequences, Gloria invoked the Triad (Y'Garon, Y'Grianth, Y'Bsalloth) in the process of acting out a spell. She summoned the demon Kthara, Mother of Demons, who possessed her, consuming her soul. 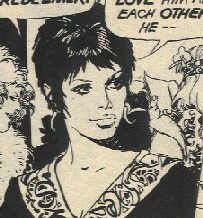 Another member of the Church attempted to rush to Gloria's rescue, but Kthara took his soul as well. Gloria's father, Lewis, sent a letter to Daimon Hellstrom, knowing him to be an expert in the occult and seeking his help in rescuing Gloria. Satana was attracted to these events as well, and she destroyed Gloria's mortal form when she summoned hte Basilisk to slay Kthara. COMMENTS: Created by Gerry Conway and Esteban Maroto. Anton Devine's Church of Lucifer actually served as a network for occult groups, so if the Church of the Dark Father is still around, it could be affiliated with him. A number of other Satanic Cults are listed in the clarifications, any of which may or may not be affiliated with the Church of the Dark Father. CHURCH of the IDENTIFIED FLYING OBJECT 2099 - --Punisher 2099# ? SATAN. Satana was unable to confirm the involvement of her father with the Ruth or the Church of the Dark Father, so it is unclear whether this represents Marduk Kurios on one of the many other demons who has taken the name of Satan.